A real estate auction can be a highly effective way to sell a property. It’s an accelerated and intense process which can reduce the length of time a property sits on the market. It can also reduce costs and effort (on both the part of the agent and sellers) associated with ongoing marketing and multiple showings of the home. In America today, an increasing number of homes are sold in this manner. But not every auction is a success story. Sometimes auction sellers (or buyers) are disappointed because their expectations were unrealistic to begin with. This is why it’s so important as a real estate agent to have clear communication with your client about their goals for the auction well in advance. Whether you’re working as a listing agent or auctioneer with the seller, or as a buyer’s agent, guiding your client to set realistic expectations in the beginning is time and effort well spent. As a real estate agent, you need to ensure your client’s goals aren’t beyond what is achievable. This means checking expectations around not only price, but also the terms and timing of the sale. Having realistic conversations early about these things is preferable to making promises which cannot be delivered. The latter will only result in disappointment when a property doesn’t achieve the optimum price the seller is looking for, or the buyer is unable to complete the purchase. An Automated Valuation Model (AVM) can be a useful tool if your client’s price goals are unrealistic in the current housing market. AVMs use public property records to create an estimate, which can be useful as a baseline for price comparisons. There’s no guarantee of the final price at an auction sale even when using an AVM, but it can be used to temper client expectations and help them to set an achievable price objective. Another option is to invite your clients to other auctions or showings of similar properties, so they can see what comparable homes are selling for. Real estate auctions can be a great opportunity for a wide range of buyers — from first-time homebuyers to people wanting to trade up and buy a bigger home. It’s certainly not all about foreclosures, which is a common misperception about auctions. Talk to your buyer upfront about the process for bidding and what needs to be paid and when. It depends on the auction, but it’s common a successful bidder will need to either pay a substantial deposit (which is often between 5% – 35%) or the entire amount immediately. In the event of a deposit being payable, the remainder is typically due in 4-8 weeks. The swift auction process means your buyer is going to need to understand the importance of having financing organized in advance. While all-cash transactions at auctions are often unrealistic for everyday buyers, ensuring that financial approvals can be processed in the timeframe required for an auction is important, so buyers don’t miss out on the home they want. The main areas of risk relating to sellers and buyers at auction are around price, timing, and terms. If you’re a seller’s agent, be sure auction is the best strategy to begin with, and ensure the vendor’s reserve price is realistic in the current market. Sometimes, properties just aren’t well-suited for auction, for example, in the case where the home has a narrow market. Knowing when an auction is a good marketing strategy is critical. In high-demand markets, such as California, where there are more buyers than properties available, an auction is typically very effective for properties in the median price-range. The rapid pace of the auction process is an area of potential risk to the agent. Most – but not all — auctions require the buyer to inspect the home prior to the commencement of the bidding process. However, even if a waiver is available, you should highly recommend an inspection to ensure your client fully understands the condition of the home and repairs and renovations which may be required. The due diligence process is somewhat compressed in an auction situation, but it’s a critical factor in helping your buyer make an informed decision about the property. Disclosure laws differ according to your state, but California’s disclosure laws are some of the most strict in the United States. However, if you’re operating in a state with less stringent requirements, be sure to request a “bidder’s disclosure packet” if it isn’t provided to you prior to the bidding process at the auction. Sometimes this is also termed a “due diligence package” or “bidder packet”. 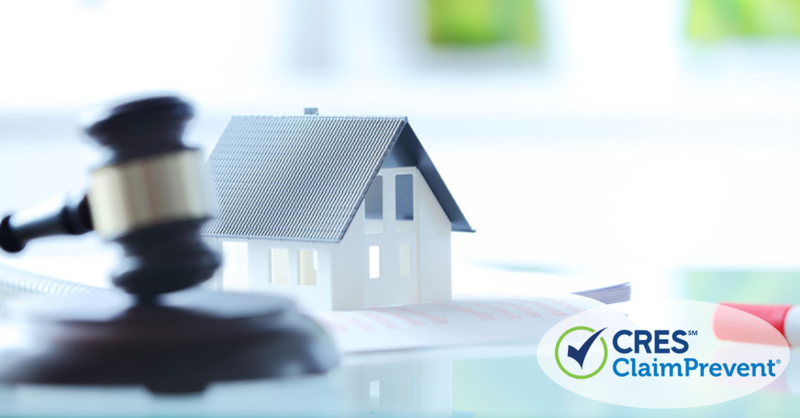 Auction properties are sold “as is”, but disclosures still apply as they would in a regular property sale, and a buyer should be able to access these before bidding begins. It’s important your client fully understands the terms of the auction. For example, in California, terms generally differ according to whether the auction is relating to a foreclosure or delinquent property tax sale or not. In California, foreclosure or delinquent property tax sales are held on business days from 9 a.m. to 5 p.m. Buyers are not allowed to view the property before bidding, anyone can bid, and the foreclosure can be postponed to another time and location by the trustee managing the sale. Some counties require sealed-envelope bids, while others require buyers to bring their bid amount in cash or cashier’s checks. In this instance, it’s important a buyer has financing arranged beforehand. In this type of auction, the highest bidder takes the property. In California, there are two types of foreclosures: non-judicial and judicial. The non-judicial path is by far the most used. In non-judicial foreclosures, the auction sale is final. There is no cooling off period with respect to committing to a loan in California. However, with judicial foreclosure, the previous owner has up to one year to redeem his property by paying the foreclosure sale plus interest and any additional expenses incurred by the lender. Legal Advice Warning: If your buyer purchases at a foreclosure auction, the buyer will be responsible for any property tax liens on the property. Before suggesting to the buyers that they bid on a property, be sure you research the foreclosure carefully. In a Foreclosure or Delinquent Property Tax Sale in California, the mandated “minimum bid” to acquire the property at the auction will be clearly stated. People who make “bids” at such an auction are making an offer to buy the property. The final bid that is accepted by the auctioneer at a Foreclosure or Delinquent Property Tax Sale puts the bidder under contract to pay for what has just been purchased. Absent any erroneous comments by the auctioneer that induced the buyer to make his or her bid, the buyer is bound by the bid contract price and is expected to honor the term under California law. With an auction-style sale of real property in California, the seller usually has expert third-party reports concerning the parcel available for review by interested buyers including, but not limited to, recent preliminary reports. Terms and conditions of the auction are normally set as well as payment and escrow requirements (if any). The auctioneer sets a minimum or reserve price for the parcel, and the bidding commences. When the last bid is submitted by the bidder, the auctioneer accepts it, forming a contract of sale (assuming the bid is over the reserve price set). There is normally no cooling off period in an auction-style bid with respect to committing to a loan in California. Note from CRES Legal Team: Offers with contingencies and acceptance process for the purchase of real estate in California provide more buyer protection. The buyer is not pressured to commit without doing his or her due diligence for the purchase of a property, such as having a third-party inspector look at the parcel before the contingency period has run out and/or getting a firm loan commitment. Most importantly, this can help protect buyers from acting on impulse to buy in an auction setting, which they may later regret. No one cares more about your daily protection than CRES. We’ve been a direct underwriter specializing in real estate E&O for more than 20 years. You’ll have superior E&O protection, with more extensive coverages specific to real estate. And with CRES E&O + ClaimPrevent®policy, you’ll have on-call access to expert Legal Advice 7 days a week. Contact us at 800.880.2747 to speak to a CRES real estate insurance professional today. Have you ever faced a situation where your client’s expectations weren’t achieved at auction? How do you ensure your client has a realistic impression of what can be achieved in terms of price and contract terms?